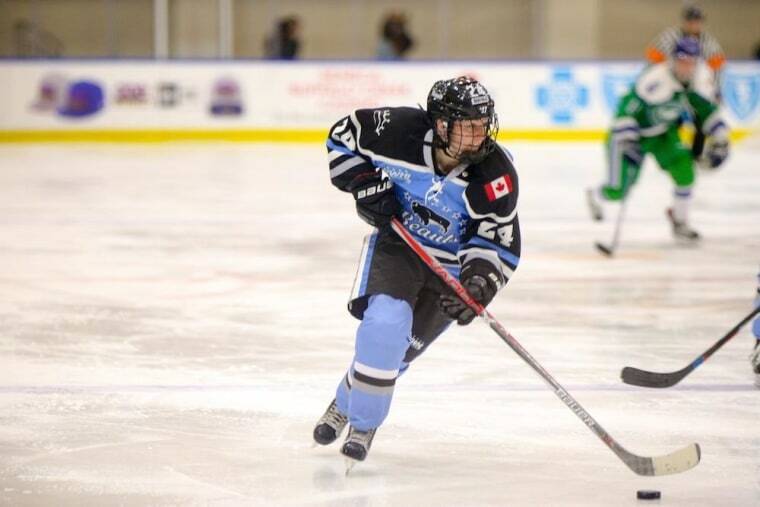 At the end of the 2016 National Women’s Hockey League (NWHL) season, Harrison Browne decided to retire. The 24-year-old was both emotionally and physically spent. His team, the Buffalo Beauts, had won the Isobel Cup — the equivalent of the Stanley Cup in the NHL —and early on in the season, he had come out to his teammates, the NWHL and the world as transgender. It was an overwhelming and dizzying six months. Browne was the first openly transgender athlete to play on a professional U.S. sports team, and the media attention was fast and furious. As a direct result of his decision to come out, the NWHL created a transgender inclusive policy, the first of its kind in any professional sport, which would allow any trans individual to play in the NWHL openly and freely. Browne made himself accessible to the media, and he did his best to field every question before and after games and in-between road trips, hoping to educate and lift up the LGBTQ community. He gained a supportive fan following via social media on Twitter and YouTube. And once he lifted the Isobel Cup into the air alongside his Beauts teammates, he felt as if he had accomplished everything he had wanted to do on the ice. Browne said when he made the decision to retire, he felt he was ready to start the next chapter of his life, begin his physical transition and trade in his hockey stick and gloves for a suit and tie. By the spring, Browne was reconsidering his retirement. He took some time to quietly reflect on what’s been happening in the world, particularly here at home in the U.S., and came to the realization that he wasn’t quite done with hockey after all. He also wanted to do more for the LGBTQ community as a whole. “Something that really spoke to me this summer was when I was reached out to by Hungary for Budapest Pride. They wanted to find LGBTQ athletes who could give a face to trans individuals, because the people who are against it are people who can’t put a face to a name, or a story to a person,” Browne explained. Browne said he delayed his physical transition, because recovery from surgery would interfere with the start of the hockey season and he would be barred from playing in the NWHL if he started hormone treatment. However, he said after waiting this long, waiting one more year isn't that big of a deal for him. Just like he did when he retired, Browne made a Youtube video to announce he was un-retiring and heading back to the ice. Except this NWHL season, he’ll be playing for the New York Riveters instead of the Beauts. The Riveters have their first official practice scheduled at the end of September. Browne has already been training and getting himself physically and mentally ready for another NWHL season. This time around, he is free to focus on just playing hockey, enjoying his time in New York City and being a positive role model for LGBTQ youth — something Browne said he really didn’t have a chance to get out there and do last season. That’s why he's looking forward to meeting different LGBTQ organizations, talking with people face-to-face and sharing his story. “I hope I inspire other people to live openly as well,” he said.